Local resident Kami Guildner brings horses as the catalyst to help people realize their true gifts and purpose in their lives through her equine guided learning agency, Syzygy TM Coaching. The foundation of this boutique agency is, “grounded in the experience of stories, nature, passion and the power of positive” to take people into their next chapter of life and in leadership. 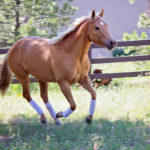 There are different branches of horse therapy and most people are familiar with Equine Assisted Therapy for both physical and mental purposes. Hippotherapy for example, is a form of physical, occupational and/or speech therapy facilitatied by therapy professionals that gives specific motor and sensory input from the horse. Hippotherapy and Therapeutic Riding give children and adults legs when they don’t have them, help them coordinate muscles and thoughts through the rhythm of the movement of the horse. Additionally, riding is a great way for people with disabilities to enjoy the outdoors and have freedom and independence. Hippotherapy is physically non-invasive compared to other kinds of physical therapy and the benefits and experiences happen naturally through contact with the horses. Riding strengthens the core muscles and teaches balance while we are together with natural, honest and thoughtful creatures. On a more mental landscape, corporations utilize equine assisted therapy to build teamwork, communication and to help people work from their strengths and gifts, making happier, better workers and stronger more dynamic companies. Horse handlers and therapists/counselors help participants breakdown and process the experiences with the horses to translate them into lessons learned. Other programs in equine assisted psychotherapy specialize in areas such as troubled youth, substance abuse, and trauma. The work that Kami does through Syzygy TM is specifically Life Coaching, bringing the horse in as the teacher and guide. 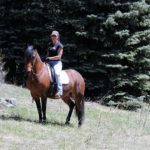 She is not a therapist or counselor, but gifted in facilitating the experiences with the horses into life changing realizations for the whole person on both professional and personal levels. No riding is involved and most participants have little to no horse experience. Horses help us to align our thoughts, bring us into the present, help us to communicate more effectively non-verbally as well as listen. Equine guided coaching is considered intensive and experiential. Horses are the keystone to coaching because they live in the moment and reflect the truth of their thoughts and our own. The equine guided coaching programs Syzygy TM offers include: Life Empowerment Coaching, Leadership Empowerment Coaching, Equine Vision Journey (an equine assisted retreat to discover your next chapter), and Equine Assisted Leadership Workshops. Syzygy TM also has events for 4-H youth and Mom’s & Daughters. 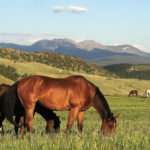 One of Kami’s favorite retreats is the annual Colorado 4-H Equine Vision Journey where our kids who are just starting their life journey get to experience horses in a new way. They learn about their own strengths, values and passions to help them shape their future lives. Syzygy TM waves the tuition for this event and there is availability non-4-H youth as well. There are open spots for this event on July 18-19. Go to www.syzygy-co.com for more information, upcoming events, testimonials and more. There are openings for the Mom’s & Daughter’s retreat, Emerging Leaders in August and the fall Equine Vision Journey.